June 27, 2012 – SQL Server Security Architecture Decomposed. Click here to start streaming. 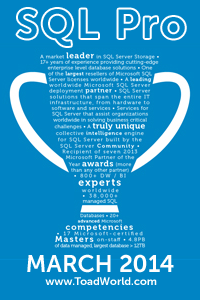 January 11, 2012 – SQL 2012 New Features. Click here to start streaming. Can you give some advice? I clicked on the “Click here to start streaming” and the window could not open file – I clicked on the window to give it permission but nothing. If you still have problems, please contact the site admins in the DBA Virtual Chapter at that link I provided. I don’t host my own videos (yet) unfortunately. It could be that my network admin is blocking wmv from being viewed or downloaded but neither IE or Google chrome will allow me to view or download wmv files. ok – found the fix. Open Windows Media Player > Options. Under Protocols for MMS URLs, select all the protocol check boxes. Now it all works and I can view the beginning of your broadcast when it is ready. So you falsely accused your Network Admin… hope he/she forgives you. Thanks for posting the fix, hopefully it helps others. Generally videos are up within a week or two. I will post the link for today’s presentation once it comes up as I have for my previous ones. When I click on the link for code and slides it says “The requested URL not found on the server”. Is the code and slide available somewhere else for me to download. Please let me know if you have access now, if not I can email you the material you want.